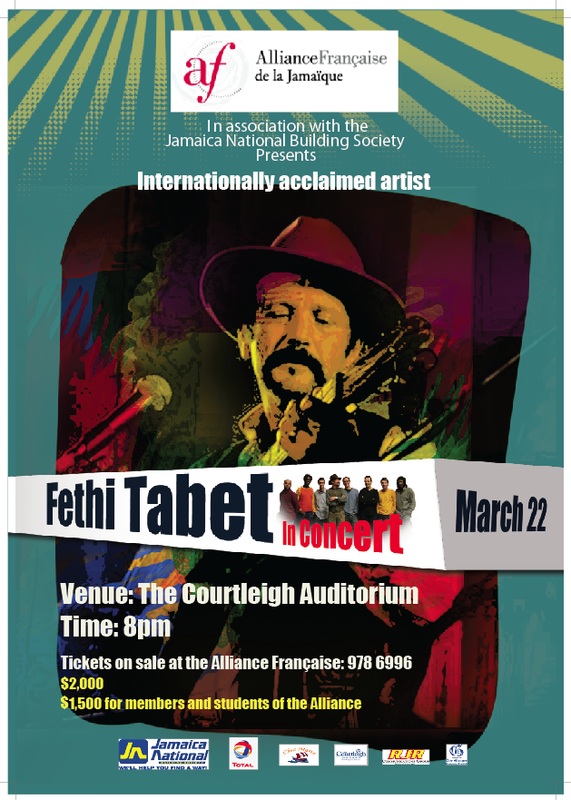 Internationally acclaimed artiste Fethi Tabet will be in concert on Thursday, March 22, 2012 at the Courtleigh Auditorium, Kingston starting at 8p.m. This singer, musician and composer has captivated audiences worldwide with his hot and powerful Andalusian style dance music, with African, South American and Mediterranean influences and is sure to captivate Jamaican audiences here as well. Tickets will be on sale at the Alliance française de la Jamaïque, 12b Lilford Ave, Kgn 10 and at Rêve Jewellery & Accessories, Shop 14, Devon House. Tickets cost $2000; $1500 for students and members of the Alliance Française. Fethi and his musicians promise a spectacular performance you do not want to miss.